This is hands-down the best chicken seasoning I have ever come across. Have something to mop up the juices on the plate or you will end up licking it! This is a rich curry flavor with little to no heat depending on the chili powder you use. 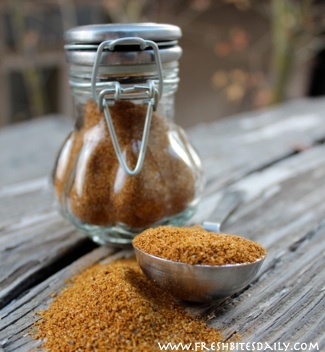 If you like heat, use a hot chili powder or some cayenne pepper. When you have mixed up all the dry ingredients you will probably think this is plenty for two chickens. Use it all on one! This is not too much flavoring. For best results, brine your chicken before applying the rub. The brining process ensures a moist tender chicken. The rub ensures unforgettable flavor. The following recipe has been adapted a bit from the original. You will probably adapt it still more. The important thing is to find the flavors that bring your family running to the dinner table! Heat the oven to 350 degrees and prepare your roasting pan. Wash and dry your brined chicken with paper towels. Rub the chicken inside and out with olive oil. Thoroughly mix all the dry ingredients in a small bowl. Use all of the rub to liberally coat the inside and outside of your bird. The amount of rub may seem outrageous to you. Get past that! 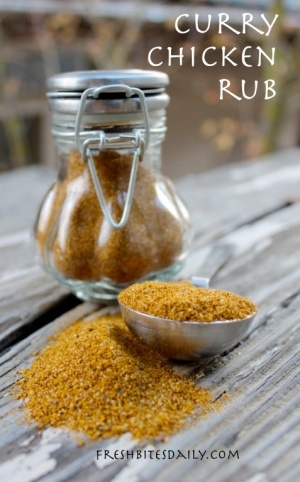 The amount of rub is what produces the full, rich flavors. Place the rubbed chicken into a roasting pan, breast side down, and place in the preheated oven. Roast for 30 minutes and turn the chicken on its back. Roast another 30 minutes and turn the chicken again. Roast for another 30 minutes with the chicken on its back. Baste the chicken with juices from the pan a few times during that last half hour. Use a thermometer: 175-180 is ideal. Pierce the thickest part of the chicken with a sharp knife — the juices should be clear and not pink. Slice into the thickest part of the meat and checking for color: If there is any pink showing, put the bird back in the oven for further cooking. Check again in 15 minutes. Allow the cooked bird to rest for 10-15 minutes before slicing. This keeps more juice in the meat and makes for prettier slices of white meat. Try not to shout and holler while you eat. This chicken is that good! 2 Comments on "A roasted curried chicken made possible with this special rub…"
Most of my recipes suggest brining a whole chicken for at least two hours and up to four. it to your favorites and the app will store it on your phone allowing you access to it later on. to help you heal yourself right after battles.